Every bit an engineering masterpiece. To many, the Rolex marque is seen as a mere status symbol. However, at its core, the brand is well-known for its reliable and dependable tool watches. 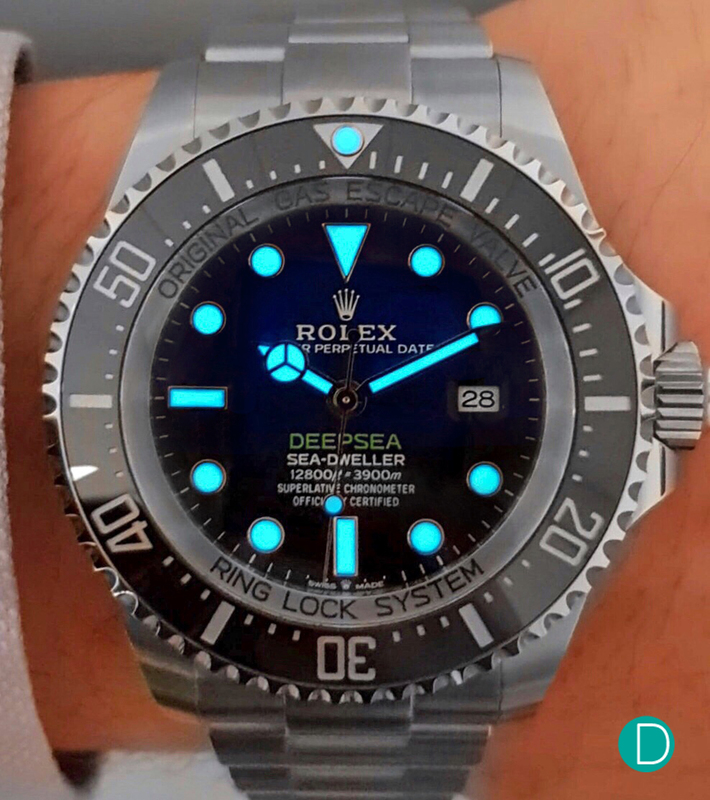 The subject of our discussion is the Rolex Deepsea Sea-Dweller: first introduced with a black dial in 2008, and in 2014, the D-Blue dial variant. Innovation and excellence: these 2 words are synonymous with Rolex’s adventurous spirit. From land to air to sea, Rolex has always been at the forefront of robust timepieces: conquering the unconquerable and scaling the unscalable. But there is one aspect which the brand can identify most prominently with: diving and deep sea exploration. 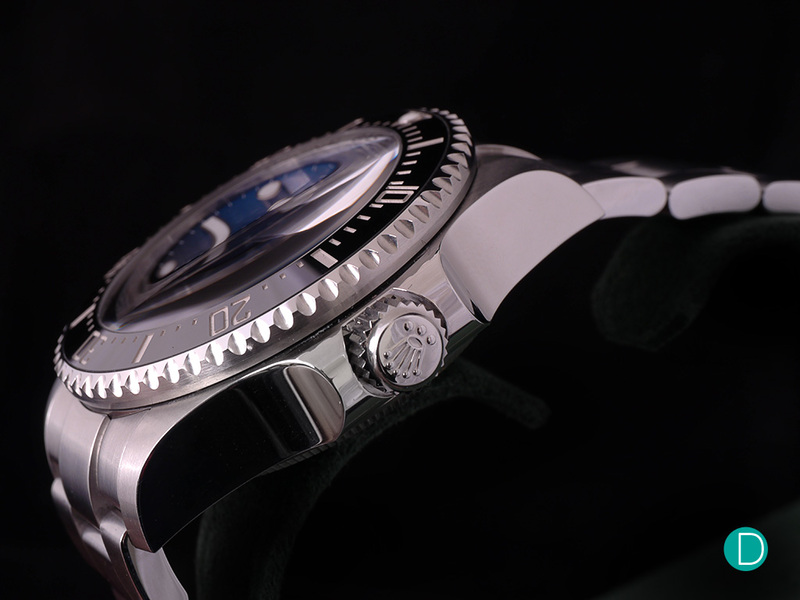 In 1960, the Deep Sea Special became the first watch to reach the bottom of the Mariana Trench. Again in 2012, with the Deep Sea Challenge. Both watches returned, fully functional, and served as the foundation for all future Rolex dive watches. We’ve covered this in great depth in our two-part article here and here. The latest iteration of the Rolex Deepsea Sea-Dweller ref. 126660 has received several cosmetic updates as well as a new movement. The Rolex Deepsea Sea-Dweller is a massive watch which may take some time getting used to. The 44mm case wears large and is hefty on the wrist. There is no denying that the Deepsea is a huge watch. Its Oystersteel case measures in at 44mm wide and 17.7mm thick, offering a tremendous amount of wrist presence (and water-proofing which we’ll cover later). “Oystersteel” is Rolex-jargon for 904L stainless steel, which it uses exclusively for its watches. A black Cerachrom insert incorporated onto the uni-directional stainless steel bezel completes its outlook. It is easy to manipulate with good grip, and produces 120 distinct clicks per revolution. Finally, the watch is equipped on the Oyster bracelet with accompanying Fliplock dive extension link and Glidelock adjustment. The new Ref. 126660 sports redesigned lugs which are thinner and narrower. In addition, the bracelet now sits flush to the case and wears more comfortably on the wrist due to its wider dimensions. The biggest differentiating factor of the new ref. 126660 are its re-designed lugs which have been slightly thinned and narrowed. As a result, the lug width is now 22mm instead of 21mm. To account for that, the oyster bracelet and Oysterlock clasp has also been widened and tapered, and for a better fit, sits flush to the case. Though minor, these cosmetic upgrades enhances the visual balance and improves comfort of the watch. The D-Blue dial was originally introduced in 2014, which pays homage to James Cameron’s historical dive down the Mariana Trench. Perhaps the most prominent aspect would be its dial. Rolex sport watches (save for the references in precious metals) generally have black or white dials. The Deepsea ref. 126660, aptly named “D-Blue”, sports a handsome, visually striking gradient dial that goes from blue to black. It is a fitting tribute to film director James Cameron’s historic dive and stands out from the norm of other dive watches. The text for “DEEPSEA” is printed at the 6 o’clock position in a bright green color similar to Cameron’s submersible. Superb legibility on the DSSD: time is easy to read under any circumstances due to its maxi-indices and bright Chromalight lume. Also seen here is the small Rolex crown at 6 o’clock, which denotes usage of the new movement. Legibility is superb. The appliqué markers are maxi-sized and have been filled with blue Chromalight: a Rolex proprietary variant of the conventional Superluminova lume which is said to glow for 8 hours. The hands set on the ref. 126660 has also undergone an aesthetic enhancement, being made slightly longer (by about a millimeter), allowing them to align flawlessly with the chapter ring. Likewise, they are filled with Chromalight. Both the marker frames and hands are made out of 18k white gold to prevent tarnishing. Finishing and build quality of the dial, hands and case is superlative with impressive attention to detail. The Oyster bracelet remains as the standard across the industry for its comfort and robustness. Simply put, the Deepsea is a superbly engineered watch entirely. Powering the watch is the C. 3235: an in-house developed automatic movement launched in 2017. It runs at 28,800 bph and features a respectable 70-hours power reserve. To boot, an accuracy rating of +/- 2 seconds per day, surpassing COSC certification standards. 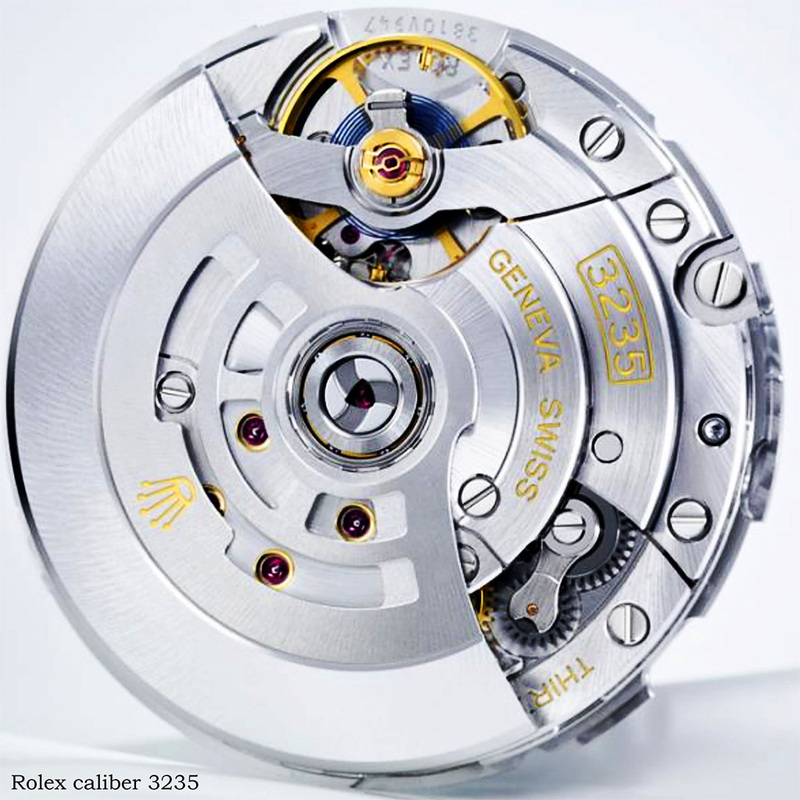 There is no clear case back to view the movement, however, it is finished to a high engineering standard. The DSSD uses the Rolex C.3235: a relatively new caliber which debuted in 2017. It is also used in the 50th anniversary Sea-Dweller. The key highlight of the C. 3235 is its patented Chronergy escapement, which runs 15% more efficiently than previous calibers. Paired with a improved gear-train and blue Parachrom hairspring, the movement is even more sturdy, reliable and dependable. 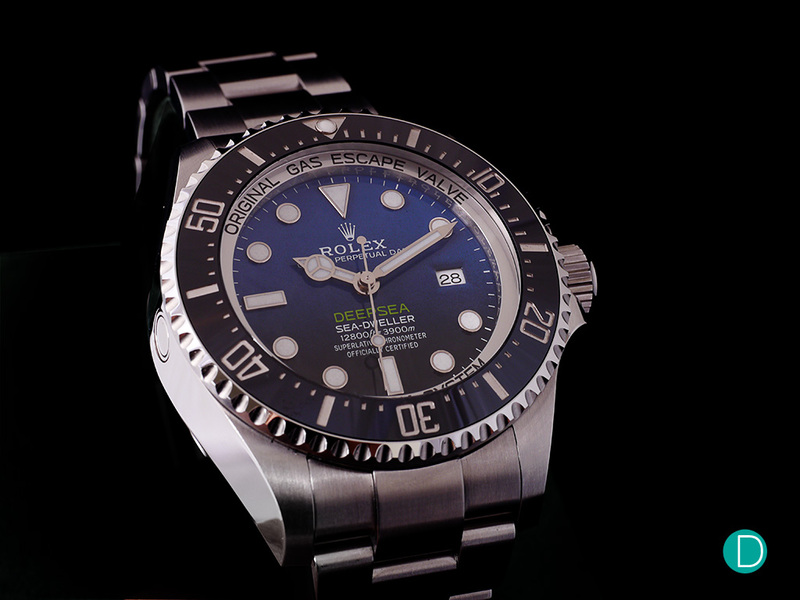 As with all Rolexes, the Deepsea is backed by a five year warranty. The chunky case constitutes only half of the ingredients necessary for its extraordinary depth rating. The other and perhaps not-so-subtle clue lies visibly beneath its crystal; the metal ring, handily engraved “RING LOCK SYSTEM”. The Ringlock system is, essentially, an inner ring to which the crystal and case back are mounted. Its objective is to reduce stress exerted by extreme pressures on the watch at extreme depths and ironically, minimise case thickness. Exploded view of the ingenious Ringlock system. Instead of placing unwanted pressure and stress on the case, the Ringlock takes the brunt of the pressure. Ringlock is made out of high performance nitrogen-alloyed steel (a.k.a. Biodur-108) and is purported to be able to withstand three times the stress of 904L stainless steel. The deeper the watch is submerged, the more the crystal and case back will tense due to the pressure, and therefore push harder on the robust metal ring – the pressure is transferred onto the ring instead of being exerted on the case. As a result, the two opposing forces exerted on the ring would cancel each other out, reducing the possibility of the case deforming. Thus, the case can be made slimmer (by 10%), translating into increased practicality and comfort for the wearer. A patent of Ringlock, denoting the various components. However, the crystal and case back still takes the brunt of the pressure from the ocean. This would explain the usage of a 5.5mm thick sapphire crystal. 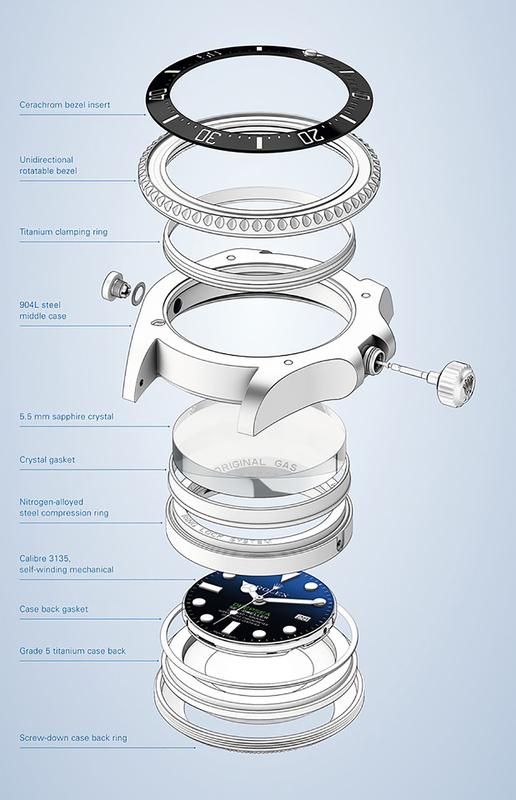 As for the case back, it is split into 2 parts: an inner 3.28mm thick back made from Grade 5 titanium (a.k.a. TA6V) which is mounted onto the Ringlock, and, a screw-down stainless steel back to protect it. 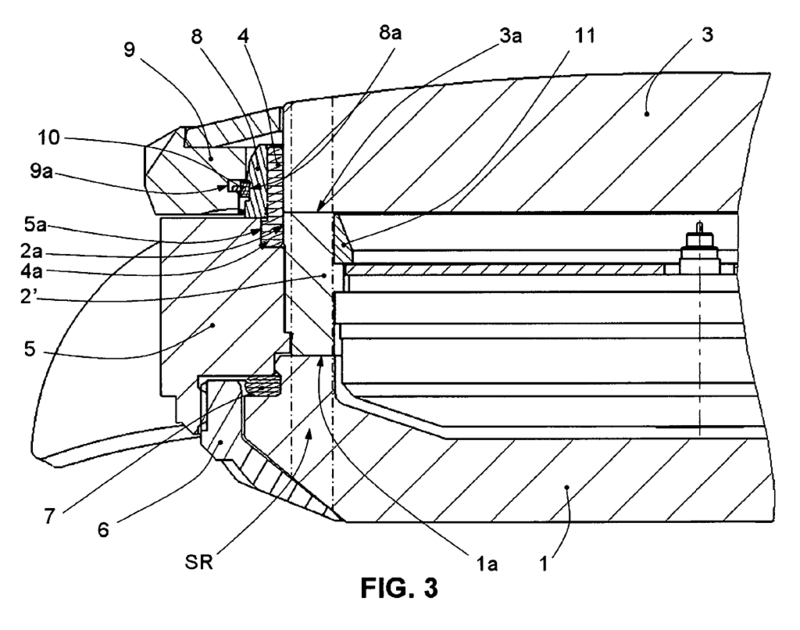 The two-part design reduces the possibility of leaks caused by warping of the metal. A screw-down Triplock crown is used to ensure complete water-tightness. The HEV is position at 9 o’clock. 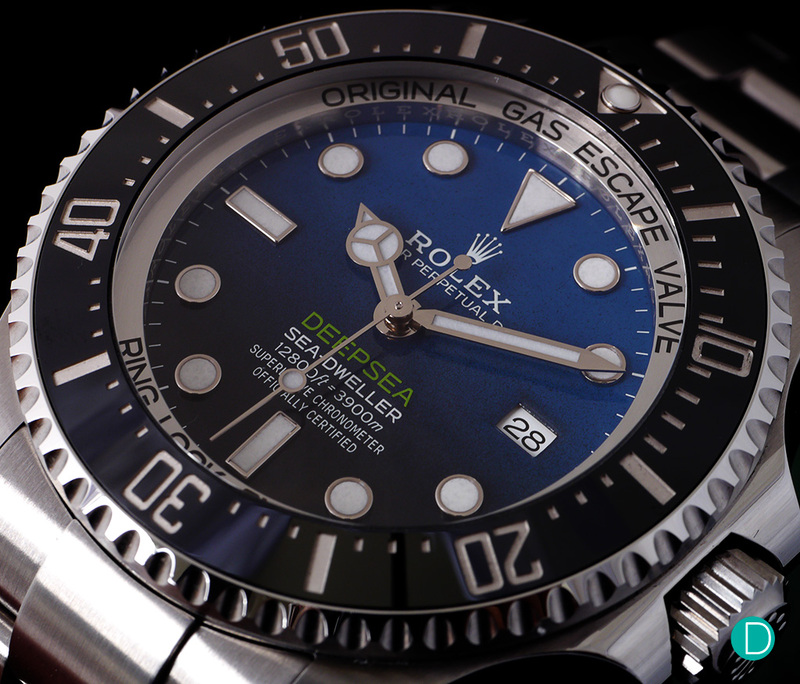 Finally, the Deepsea is fitted with a helium escape valve (HEV) and Triplock – two characteristic traits of Rolex’s professional dive watches. We’ve covered this in detail for our Sea-Dweller review here. All in all, the watch is able to withstand an achieve an incredible depth rating of 3900m/12,800ft – more than 3 times the depth of Rolex’s classic saturation diver, the Sea-Dweller 126600. An interesting tidbit is the testing and certification of the Deepsea. 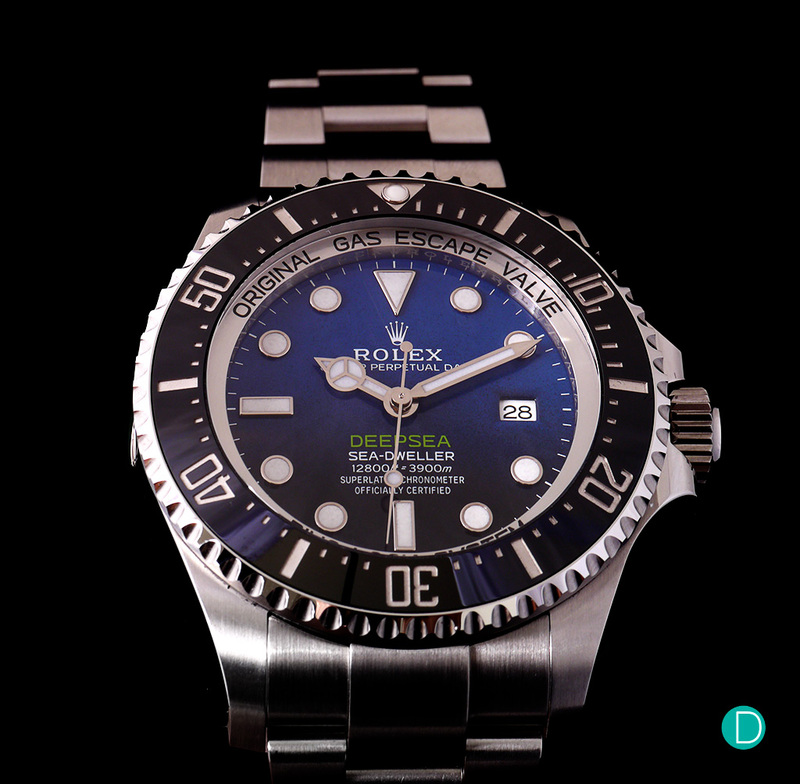 Rolex uses a hyperbaric chamber supplied by Comex to test every Deepsea it produces. 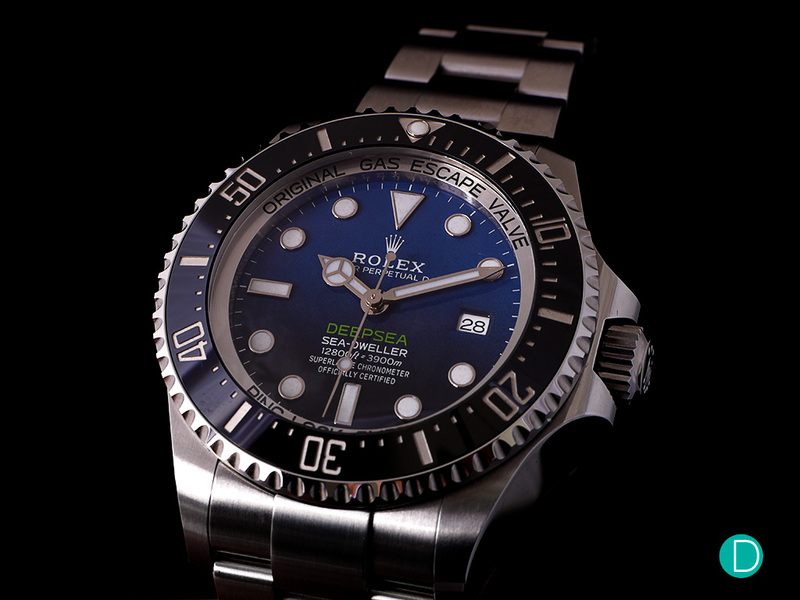 The Rolex Deepsea Sea-Dweller D-Blue ref. 126660 has a recommended retail price of SGD 16,940. As discussed earlier, the watch is undoubtedly huge due to its professional diving specifications. Frankly, we recognise that most Deepseas will never be used for their design intents, making it an “acquired taste” timepiece among buyers. For that reason, we’ve covered its alternatives in another article here. However, only a few are capable of matching up to the Deepsea’s impressive technical feats for saturation diving. Here is a non-exhaustive list of such timepieces. We begin with the Grand Seiko Hi-Beat 36,000 Diver SBGH257. We can’t deny the breathtaking haute horology zaratsu finishing and technical innovations. Instead of a conventional HEV, the GS utilises a specially designed L-shaped gasket and screw-down glass fixing. Additionally its magnetic resistance of 80,000 A/m is achieved through a iron-made dial and heavy duty titanium case. Though its depth rating falls short at 600m, it is still sufficient for saturation diving. The Grand Seiko retails for USD 9,800. The Breitling Avenger II Seawolf (ref. A1733110/BC31/169A) is rated to 3000m water resistance. Its satin-finished case is rather chunky, measuring 45mm wide and 18.40mm broad. The watch is equipped with a helium escape value, screw down crown and unidirectional rotating bezel. Powering it is the Breitling Caliber 17: a COSC certified movement with 40-hours power reserve. The Breitling retails for USD 4,325 on a stainless steel bracelet. The Ball Engineer Hydrocarbon Deepquest is also rated to 3000m and features an automatic helium escape valve. It sports a 16mm thick monocoque titanium case for water resistance, and micro gas tubes. Additionally, the watch features shock and magnetic resistance of 7,500Gs and 4,800 A/m respectively. It is powered by a COSC-certified ETA 2823-A2. The Ball is priced at USD 5,700. The Deepsea has always been an outlier – a love it or hate it watch. Its bulky case and quirky design cues may not suit the likes of everyone, but, it is every bit a technical (and engineering) masterpiece. The D-Blue dial is gorgeous and adds a splash of color to the otherwise monotonous Rolex sports lineup. Its versatility is admirable – being able to perform equally well for desk dives and actual diving. While the refresh might not seem substantial, it certainly brings this watch up-to-date aesthetically and mechanically – whether the upgrade is warranted is entirely up to the reader. Nonetheless, we feel it’s a much appreciated and welcome change.